The plan was to pick up Glendora Mountain Road (GMR) in the city of Azusa and ride it up to the crest where GMR meets Glendora Ridge Road (GRR) where we could stop for a moment and enjoy the view before heading back down. As we exited the freeway, I tapped the dial on my headset to switch on the intercom with my wife and remind her to lean with me into the turns. We kept the line open and I gave her a little bit of a talk through what was to come. Within minutes, we had reached the base of the mountain. I tapped the ESA button and firmed the suspension to the sport setting before ripping open the throttle. 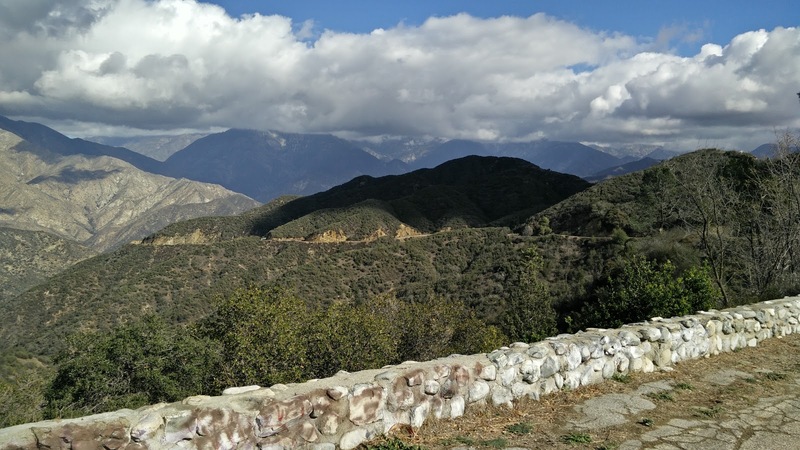 If you have never been to GMR, going up from Azusa means taking San Gabriel Canyon Road to East Fork Road and the picking up GMR near the San Gabriel River. 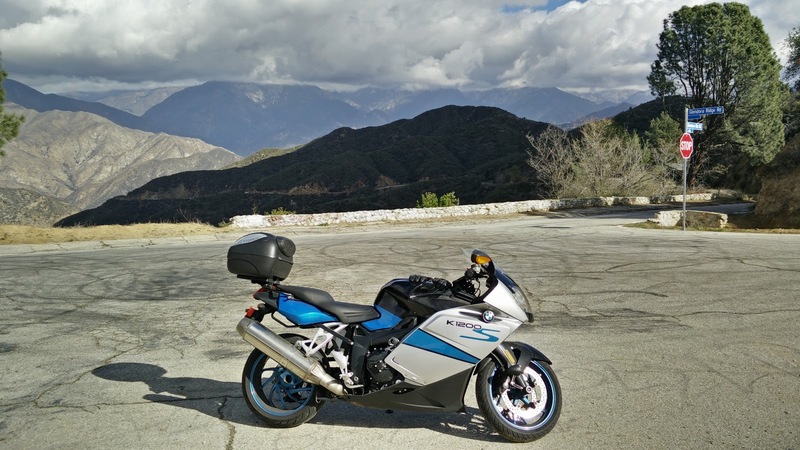 The road winds like an insane maze up the side of the mountain for many miles, offering a challenging ride that is an absolute blast on a motorcycle. On this day, however, riding the Beemer, with its long wheelbase and loaded up with an extra person, the road felt like a real monster. The first part of the ride on San Gabriel Canyon Road took us right by both the Morris and San Gabriel Reservoirs, which, owing to the ongoing drought in California, were almost completely dry. You could see just how high the water level used to be by the lines on the banks and the little mounds they built into the bottom of the reservoir were now completely visible. It is a stark contrast to when I used to drive this road over a decade ago and the reservoir was always brimming from the snowfall, even in slightly drier years. Definitely makes the current drought situation a lot more prescient. As the elevation rose, the temperatures fell. 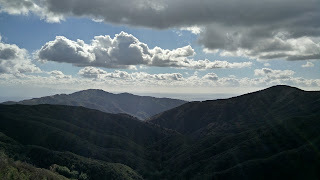 We turned onto the connector to GMR, upped the pace a bit in the interest of time since we had a destination to make. Leaning into the first corner, I hear a gasp in my ear. 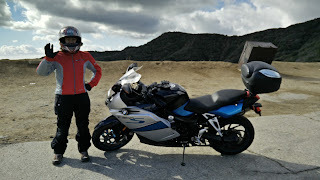 Somehow, I had failed to realize that this is the first time that my wife had ridden with me on the bike through such tight corners and it was the first time she had experienced such high lean angles. I slowed the pace a brief moment to give her a quick reminder of what to do before getting back in the groove and focusing on the road before us. Unlike the last time I came up here, riding a rented Ducati Monster, the road felt significantly more challenging. With the extra weight of a passenger and luggage on a bike with a 550 lb curb weight plus the extra long wheelbase, carving through the undulating mountain switchbacks required a whole other level of attention. Dropping the big bike into corners is a real testament as to just how good the suspension is and just how stable the bike is while cornering. Many people have complaints about how the Duolever suspension provides less feedback than a traditional dual piston fork, but the rock solid stability and fantastic maneuverability afforded by the Duolever is a worthy trade-off, especially in light of how good it is at minimizing brake dive no matter how hard I jam the lever. We reach the midway point and I make the rookie mistake of trying to turn the bike around on a dirt incline, resulting in me dropping the bike at a standstill. Luckily, the frame sliders did their job and aside from a little scuff on the slider itself, no damage was incurred. Once I got the bike righted and parked, we walked around a moment to enjoy the view. 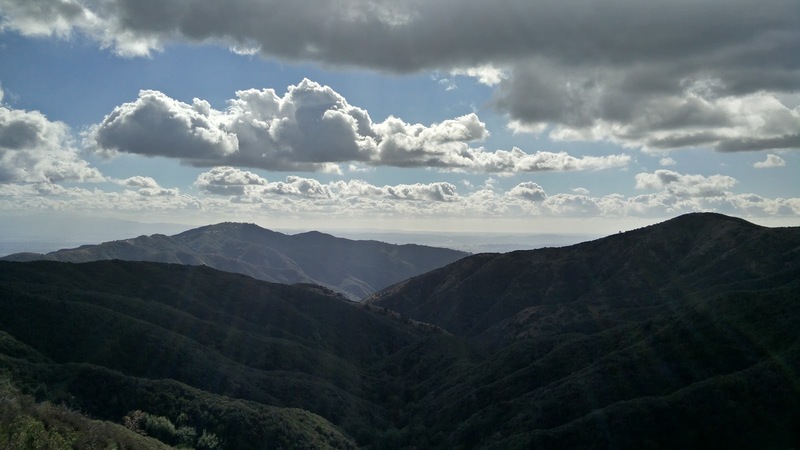 From up here, when the air is clear, it is possible to see deep into LA County to the south and all the way to the Pacific Ocean to the west. Once my wife had given her legs a proper stretch, we hopped back on the bike and began our descent down the other side of the mountain. This leg of the road is even more twisty than the road coming up and the larger number of hairpins makes for some spectacular views. Since she was feeling more comfortable, my wife gave the okay to pick up the pace. Winding back and forth on this roller coaster of a road, we make quick progress and before too long, find ourselves at the base of the mountains. 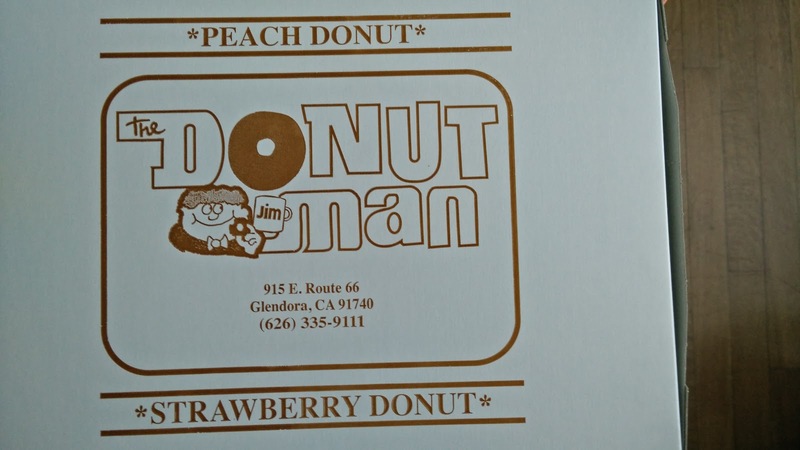 Turning onto Old Route 66, we zoom, post haste, towards The Donut Man, one of the favored haunts from my college years. 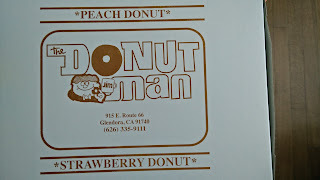 Known for their fresh fruit filled donuts, especially the fresh strawberry donut, we hoped to snag a few before we turned around to head home. Luckily, we caught them before they left as they were observing holiday hours and closing early. While not fortunate enough to get some out of season strawberry donuts, we did manage a decent selection of other donuts to snack on as well as take home. No matter how many times I ride GMR, it always presents a new challenge. Some days the challenges are related to the road, some days they are mental. I cannot stress how much fun the road is and it was fun to share the experience with my wife. The opportunity to ride two-up on a road as serpentine as GMR is one that I enjoyed despite the new challenges it presented and having gone through it, I got to push my self a little and hopefully became a better rider for it.